Among the most moving places to visit in the capital of Belgium, is Martyrs' Square in Brussels, where over 400 heroes of the Belgian Revolution of 1830 lie buried in a crypt beneath the cobblestones. This square is usually known by its French name, La Place des Martyrs, or also by its Dutch name, De Martelaarsplaats. Many of the dead here lie not far from where they were shot, in fierce battles amid the Brussels streets and barricades. A wonderful monument here honours these heroes who died for the cause of freedom, in the brief 1830-31 revolutionary war that created the Belgian nation. Particularly extraordinary and moving at the Place des Martyrs - Martelaarsplaats, are four beautiful sculptures of angels, with the angels´ faces in touchingly eternal expressions of mourning for the brave ones who gave their lives for the freedom of others. These are photos from the daily life of writer, journalist and political refugee from the US, Dr Les (Leslie) Sachs - I am someone who also has nearly died fighting for freedom for others. These Flickr photos document my new beloved home city of Brussels, Belgium, my life among the people and Kingdom who have given me safety in the face of the threats to destroy me. Brussels has a noble history of providing a safe haven to other dissident refugee writers, such as Victor Hugo, Karl Marx, Charles Baudelaire, and Alexandre Dumas, and I shall forever be grateful that Brussels and Belgium have helped to protect my own life as well. I'm happy to help convey to the world some of Brussels' wonderful cultural heritage. The Place des Martyrs - Martelaarsplaats remains a place where today's Belgians continue to remember and honour the heroes who died for them. Some weeks before the earlier group of these pictures were taken, on one rainy morning, I stood at the Place des Martyrs - Martelaarsplaats in the pouring rain, with a small group of Belgians in their 60s, 70s, and 80s, a number of them frail and supporting themselves unsteadily with canes on the uneven cobblestone surface, while a brass band was playing patriotic music. Though the rain was pouring down heavily on the Place des Martyrs, these elderly Belgians did not mind getting drenched, whatever the risk to their health, because these good people were children when the Nazis occupied Belgium, and that rainy day was a day to remember the Belgians who died fighting the fascist occupiers. The history of Belgium is not easy to outline. Belgium is today a nation with three official languages, reflecting its two large language groups of French and Dutch speakers, along with a small area whose native language is German. The Romans and Julius Caesar were in the neighbourhood over 2000 years ago, and Caesar wrote of fighting some fierce tribes here called the "Belgae", from whom the nation takes its name. As the Roman Empire fell apart, the Belgian region was home to the Merovingian kings in the early "dark ages", and then was part of the empire of Charlemagne. Under Charlemagne's grandson Lothair and great-grandson King Lothair II, the area of current Belgium was part of a kingdom of 'Lotharingia' whose name we know today as the French 'Lorraine'. This kingdom rapidly divided among royal heirs, with 'Upper Lorraine' roughly inside what is now France, and Brussels becoming the capital of a 'Duchy of Lower Lorraine' - roughly today's Low Countries - when a castle was built in Brussels' old centre around the year 979. Borders and regional identity continued to change quickly in the centuries after Charlemagne, the "high middle ages". What was 'Lower Lorraine' gave way to several of the great mediaeval territories and dukedoms spreading across differing sections of what is now Belgium, with names we still hear today: Flanders, Brabant, Luxembourg. And various smaller territories and fiefdoms were also a part here, amid the ever-shifting landscape of mediaeval and feudal Europe. The middle part of Belgium, including Brussels, was the historic territory of Brabant, and the Dukes of Brabant, about the year 1100, built premises right at what is known today in Brussels as the Royal Square - Place Royale - Kongingsplaats. Brabant and much of Belgium then came to be part of the great late-mediaeval dukedom of Burgundy, which reached the height of influence in the 1400s with Brussels as the Burgundian capital along with Dijon. At its height, Burgundy was regarded by many as the richest court in all Europe. Today's independent Belgium is thus a remnant of that long-ago much larger Renaissance realm of Burgundy, as well as of the even more ancient kingdom of mediaeval Lotharingia. The area of today's Belgium kept its leading role in Europe in the early 1500s, as Burgundy in turn was enveloped into the Holy Roman Empire at its height. The towns of Belgium gave birth and upbringing to the Emperor Charles V, who at one point ruled most of Europe from Brussels. So, about 500 years ago, Brussels was already the 'centre' of Europe. After Charles, his empire began to break apart, and the territory of today's Belgium had a succession of foreign rulers from within Charles V's widely-flung Habsburg family: First the Spanish, who kept hold of the territory we now call Belgium, while the Dutch to the north broke away during the Protestant Reformation. After the 'War of the Spanish Succession', the Habsburg territories were further divided, with Belgium going under Austrian control from 1714 onwards. It was under the Austrians, in the late 1700s, that elegant buildings began to be built around a large square which was named the Place Saint-Michel, or Saint Michael's Square. This would later become Place des Martyrs - Martelaarsplaats that you see here. The beginning of the end of Austrian rule, and the beginning of the story of modern independent Belgium, was the 'Brabantine Revolution' (Révolution Brabançonne - Brabantse Revolutie), whereby in 1789 much of what is now Belgium, asserted its full independence from its then-rulers, the Habsburg emperors of Austria. In sympathy and parallel with the epoch-changing revolution of 1789 in next-door France, the rebellious provinces of 'Austrian Netherlands' also went into rebellion that same year, and declared the deposition of the Austrian Habsburg Emperor, and the creation of the 'United Belgian States' (États-Belgiques-Unis - Verenigde Belgische Staten), which endured only briefly in 1789-1790. The 'Belgian' name came from the Latin word used by Julius Caesar to identify the fierce fighting tribes who inhabited this region in Caesar's day, the 'Belgae'. In 1789, the seals of the document declaring the 'United Belgian States' to be 'free' and 'independent', were ornamented by silken tassels of black, yellow and red. The flag of the short-lived Belgian nation of 1789-90, then used these three colours, though in horizontal stripes and in a different order than the current vertically-striped Belgian flag. The Austrians were able to briefly re-assert control of Belgium in 1790, then lost it to French control in 1792, and won it back one final time in 1793-94. The French then retained control, annexing most of what is now Belgium into France in 1795. As the Napoleonic era ended, Belgium was separated from France in 1814-1815. As Napoléon was being defeated and his Empire terminated, the European nations meeting at the Council of Vienna of 1814-15, thought that the territories north of France, including modern Belgium and Luxembourg, should all be under the Dutch monarch, creating a single large buffer state between France and England. The European powers meeting in Vienna avoided what might have seemed a more logical idea, of uniting only Dutch-speaking regions with the Netherlands, while letting the French-speaking regions of Wallonia remain united with France. The powers of 1815 did not want to reward France with territorial expansion to the north, precisely in the area around where Napoléon met his final defeat at Waterloo. But the Vienna plan of shoving the French-speakers of Wallonia into a new Dutch monarchy, and expanding the Dutch nation and doubling its size, proved to be very unstable. The Dutch of the Netherlands were predominantly Protestant, while the southern populations, including the Dutch-speakers of Flanders, were predominantly Roman Catholic. And not only did the Catholic territories have large numbers of French speakers, the people in Flanders also speak a modestly different Dutch than in the Netherlands, which led them to chafe against the Dutch monarchy in sympathy with their French-speaking neighbours. Tensions grew until an August, 1830 performance at the Brussels opera house, where political rebellion portrayed on the stage, became a catalyst for rebellion in the streets. In September of 1830 the street rebellions became a full-blown revolution for Belgian independence. The Place Saint-Michel, Saint Michael's Square, a few hundred metres from the opera house where the fuse for revolution had been lit, became a key site for the declaration of Belgian liberty and independence, and a pivotal site in the fierce and deadly street battles. The central days of the revolution in September 1830 - the 23rd, 24th, 25th and 26th - are the dates inscribed upon the tablet held by the high figure in the monument that you see in the photos, representing the angel or goddess of the Belgian home nation (Latin 'patria'), with a lion by her side. In 1830, with the hundreds of dead from the revolutionary battles, the decision was made to bury them there at the square, which now became the Square of the Martyrs of Freedom. The revolution was quickly successful. Some battles continued to take place into 1831, as the Dutch made a last try to hold onto the Belgian territory, but the separation of Belgium and Luxembourg was speedily recognised and secured by the other European powers. The Revolution of 1830 enabled Belgium to finally fulfil the dreams of the Belgian revolutionaries of 1789. The current Belgian tri-colour flag was established in 1831, using the 1789 colours of the 'Brabantine Revolution'. Belgium became a nation and even acquired a king of its own, the Protestant German Leopold of Saxe-Coburg, who agreed to marry the Catholic daughter of the French monarch, and raise their children as French-speaking Roman Catholics, while he became the first hereditary King of the Belgians. And today, the political refugee Dr Les (Leslie) Sachs, may owe the saving of his life in the face of the threats to murder him, to protection extended from the royal household of the King of the Belgians, the descendant of that first Belgian monarch. Léopold I, who was born in 1790, reigned in Belgium until 1865. Early in his reign, he supervised the building of this monument at Martyrs' Square. 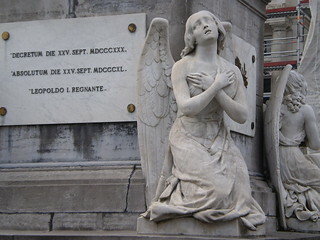 In one of the photos of the angels by the monument, you see between two angels the large plaque with the text in Latin. Two dates are given. The first is that of the declaration of the nation's identity, on the 25th of September 1830, a date closely tied to the death of the martyrs buried in the crypt below. The second date, the 25th of September 1840, is the date of the completion and dedication of the main part of the monument, with the final line noting that this took place under Léopold I as the reigning monarch. Though the main monument structure was indeed completed and dedicated in 1840, the lovely and magnificent angels were added some years later, in 1848. Today, it is these sculptured angels which, above all, give Martyrs' Square its high character of deep emotion and magnificence. The buildings around the square have, over the centuries, partially fallen into a difficult state, and you see one of the buildings undergoing inside-out comprehensive renovation in the photos. The overall revival and restoration of Martyrs' Square has been given a major boost, however, by the government of Belgium's majority Flemish-speaking region. Belgium today is about 60 per cent Dutch-speaking, with most of the remainder French-speakers along with a few native German-speakers. Brussels itself is officially bi-lingual, and historically was predominantly a Dutch-speaking city through the centuries, from the mediaeval and Renaissance era down to early modern times. However, this changed in the 1800s, and Brussels today is at least 70 per cent French-speaking, with many of the rest of Brussels residents foreign-born rather than Dutch-speaking. Yet, in one of the many curious paradoxes of Belgium's governmental arrangements, the predominantly French-speaking Brussels remains the 'capital' of the Dutch-speaking region of Flanders, while the French language community of Belgium has its capital in the provincial city of Namur. Thus today, the Martelaarsplaats - Place des Martyrs, is the site of major national offices of Dutch-speaking Flanders. The Flemish government holds the two major buildings facing each other across the longer distance of the square, and the one you see in the photos in close-up with the three flags over the doorway (the EU flag, the Belgian flag, and the predominantly yellow Flemish flag) is actually the 'Kabinet van de Minister-President' of the 'Vlaamse Regering', or the 'Office of the Minister-President' (Prime Minister) of the Flemish government. In front of the office of the Flemish Prime Minister, is a monument built in 1897 and dedicated to one of the particular martyrs of the Revolution, Jenneval. 'Jenneval' was the stage name of Louis Alexandre Hippolyte Dechez, as 'Jenneval' a well-known actor, who died from wounds in battle in October 1830. But some weeks before his death, Jenneval penned some of the original words to the Belgian national anthem, the Brabançonne. This monument to Jenneval was dedicated in 1897, on September 25th, precisely amid the 67th anniversary of the 1830 Belgian revolution for independence. On the far opposite side of the Place des Martyrs - Martelaarsplaats, in front of the other Flemish government building here, is a monument to another hero of the Belgian Revolution, Comte (Count) Frédéric de Mérode, who was mortally wounded in battle in October 1830 and died a few days later in early November. His brother, Count Félix de Mérode, was a major figure in the Belgian provisional government in the weeks of revolution. The map with this Flickr photo set will show you how to walk to the Place des Martyrs - Martelaarsplaats. It is a few minutes' walk from either the De Brouckère or Rogier métro stations, via the popular rue Neuve - Nieuwstraat shopping promenade that runs between De Brouckère and Rogier. As you walk along the rue Neuve - Nieuwstraat, you see it visible a very few metres to the east along one of the intersections, at the Rue Saint-Michel - Sint-Michielsstraat, with the central monument of the Place des Martyrs - Martelaarsplaats clearly visible.